Teamster members should be outraged there dues are used to attack local business. Most of the action is being played out right now in Oakland City Council’s Community and Economic Development Committee, which I’ve been covering for The Oakland Post and reporters Steve Tavares and Joshua Cain and Jennifer Inez Ward have been tag-teaming for Oakland Local. To understand what’s currently at issue, you have to keep in mind that when the old Army Base originally closed up it was split into two portions, one going to the city of Oakland, the other to the Port of Oakland. The city is in the process of developing its portion through Tagami and his California Capital & Investment Group - CC&IG - while for the time being, the port is holding off on the development of its portion. It’s a complicated issue, but basically it involves the fact that OMSS has a pending separate tentative arrangement - not yet a full contract - to develop 15 acres of the army base for the city, which would almost certainly revert to Mr. Tagami if the OMSS eviction from the Oakland portion of the base - which Mr. Tagami is handling, remember - is screwed up enough that it leaves OMSS without a new location to go to and forces them out of the port-support business. Maybe the old Teamster charges against Mr. Aboudi and OMSS are valid, maybe not. But the timing sure seems, um, interesting, that they came out immediately after Mr. Aboudi made his public complaint against Mr. Tagami. It doesn’t take much understanding of contracts or construction to follow the thread, but I’ll try to make it as simple as possible. Top Grade Construction had contracted with the Army Base developer - Phil Tagami - to do some Army Base development work, after which Oakland city staff members tried to push through a city contract with Top Grade without going through the proper city procedures (according to the City Auditor), after which Mr. Reid and Ms. Brooks intervened - improperly according to the Auditor - to get the improper Army Base contract out of the hands of Mr. Tagami’s preferred contractors, Top Grade Construction, after which the City Auditor took out after Mr. Reid and Ms. Brooks, but not originally improperly-handled contract to Mr. Tagami’s friends, Top Grade. Predictably, my local media friends focused on the audit criticisms of Mr. Reid and Ms. Brooks, but largely ignored the finding that the original Top Grade contract was improperly handled by city staff. 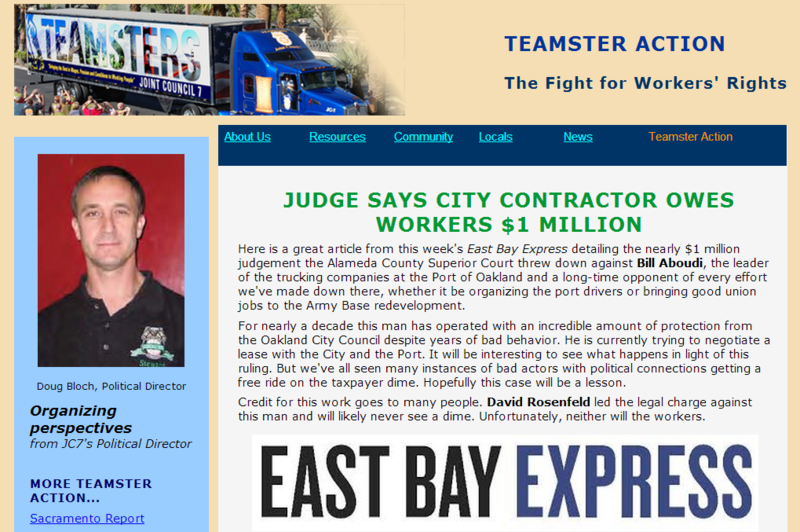 The Teamsters and The East Bay Express may be absolutely correct in their charges against Mr. Aboudi and OMSS. The City Auditor may be just as correct in the charges made against Mr. Reid and Ms. Brooks. But it seems like something of a coincidence, doesn’t it, that these charges only rose to the surface immediately after Mr. Aboudi, Mr. Reid, and Ms. Brooks went after Mr. Tagami. There’s no crying in baseball, so they say. Maybe there are no coincidences in politics, either. But that remains to be seen. Keep watching. Counterpoints is a weekly opinion column featured in Oakland Local. The viewpoints and comments are that of the authors alone. Jesse Douglas Allen-Taylor is an Oakland native who worked for many years in the African-American Freedom Movement, most of them in the Deep South. He is a journalist and political and social columnist who has written for publications nationally and in the Bay Area. Jesse, you make some interesting points about the media not picking up the Top Grade angle. However, it requires suspension of disbelief to uphold your implication that the City Auditor is somehow under the direction of Mr. Tagami -- considering that in 2011, that same City Auditor also found that Mr. Tagami's company had overseen tens of millions of dollars in cost overruns in the Fox Theater renovation, which Ms. Ruby attributed to a "leadership vacuum." What's also interesting, is that the 2011 report also found that both Tagami and Turner Construction had been overpaid, and that Turner subcontracted to the tune of $22 million without going through a competitive bidding process. Ms. Ruby also cautioned that the city should learn from its past mistakes so they are not repeated during the Army Base redevelopment--a prescient, if not Cassandra-esque comment, as it turns out. It was easy enough to find this info with a simple Google search using the keywords "fox theater oakland overpayment city auditor." In other words, to use your baseball analogy, the City Auditor is an umpire, not a player for either team.